The 1842 Treaty of Nanjing contributed to jump-starting the transformation of Shanghai from a fishing village to the largest international port of China during the late 19th and the first half of the 20th centuries. The city has long been considered China’s hub of East-meets-West cultural exchange, open to new and foreign ideas, inventions and even fashion. Prior to the Second World War, “Old Shanghai” as it was known to locals, had become the “Paris of the Orient”—synonymous with pleasure, decadence, glitz, power and money. As the first city largely exposed to Western culture in the Chinese mainland, old Shanghai represented a convergence of Western influences and Chinese traditions. Modern technology was introduced to Shanghai from the West as early as in the mid-19th century. Banks first appeared in the city in 1848 and gaslights in 1865. Citizens started to use telephones in 1881 and tap water in 1884. Up until 1908, cars and trams had already been shuttling to and fro in the city streets. Around eight months after French brothers Auguste and Louis Lumière made the first public screening of motion pictures in 1895, Shanghai’s first cinema opened in the Hongkou District. As a coastal city, Shanghai not only received modern technology but also the culture of the West. From 1840 to 1949, newspapers, theater performances, circuses, phonorecords, photos and European food flourished in the city. In China, Shanghai was the first city to adopt the Gregorian calendar, follow Western legal systems, brokerage systems and corporate governance, and to establish companies, libraries and museums. Old Shanghai held the history of being a global city and this feature was displayed in its architecture as well. The Bund housed dozens of buildings of various architectural styles. The “Exotic building clusters in the Bund of Shanghai” referred to the 28 historical buildings with over 10 floors, displaying predominantly Romanesque Revival, Gothic Revival, Renaissance Revival, Baroque Revival, Neo-Classical or Beaux-Arts styles. For instance, the Sassoon House (No. 20, The Bund), which forms the northern part of the Peace Hotel today, had its guest rooms decorated in the styles of Britain, France, India, Japan, China and four other countries. The Shanghai Club Building (No. 2, The Bund) had a 300-square-meter dining room with no supporting columns. It was also famous for its 36-metre-long bar, which was praised as the world’s longest bar at that time. The HSBC Building (No. 12, The Bund), now used by the Shanghai Pudong Development Bank, was once called “the most luxurious building between the Suez Canal and the Bering Strait.” The building exterior adopted a Greek design with ionic columns that penetrated from the second to the fourth floors. A pair of bronze lions were shipped from Britain and set in front of the main entrance. Inside the building, the columns and floors were made from marble. In the center was a dome, decorated with a 200-square-meter mural painting in colored mosaic, which was designed by British artists and completed by Italian craftsmen. In 1909, a Western missionary gave a vivid account of the street scenes in the city center. In his description, walking along Nanjing Road was just like passing through an international carnival parade. One might encounter big Russian men with bushy beards, plump Germans or tiny Japanese army officers. Or, in particular, when taking off his hat on the narrow pavement, a French man carelessly pushing an Indian in a gorgeous yellow silk suit. What he heard was German mixed with London slang. People in fashionable Parisian clothes standing beside workers dressed in rags, and sailors on tandems dashing down, narrowly missing two Japanese women in kimonos and getas. A Russian shop owner who confused his customers by marking and labeling all the goods in Russian. On the other side of the road a Japanese barbershop posting an advertisement written in poor English that guaranteed a low price for haircuts. American philosopher John Dewey (1859–1952) arrived in Shanghai in 1919. Excited and energized by the Chinese students’ May Fourth Movement to protest against the Chinese government’s weak response to the Treaty of Versailles, he stayed in China for two years, giving lectures and writing articles. Other famous scholars and celebrities followed, such as Bertrand Russell, Albert Einstein, Rabindranath Tagore and Charlie Chaplin. They all came to visit this metropolis, bringing the latest thoughts and ideas on paintings, sculptures, music, literature and the other arts. During the Second World War, Shanghai provided a haven for more than 30,000 visa-less Jewish refugees, exceeding the total population of Jewish refugees that were settled in Canada, Australia, India, South Africa and New Zealand. Shanghai accepted them without asking for visas or any other documents. Most of them lived in Shanghai till the end of the war. The night before the Battle of Shanghai in 1937, a British man wrote that Shanghai was more than a temporary accommodation for foreigners. For most of them, the metropolis was their permanent home. 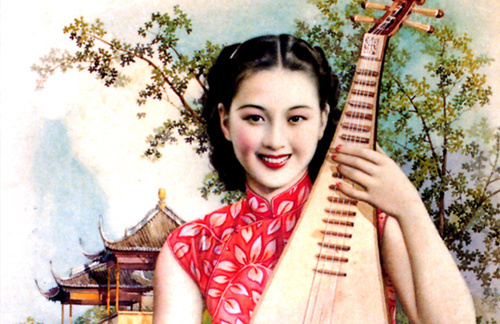 Shanghai in the 1920s and 30s was a symbol of fashion. It epitomized the most glamorous and most stylish dimension of China in the last century, on par with Paris. The great popularity of arts from the west brought knowledge of Western customs and fashion into people’s everyday lives. Exotic restaurants and cafés became quite popular in the urban areas, such as the Xinya Restaurant on the Nanjing Road, the authentic western café called “Chocolate Shop” (Sha Li Wen) or some Russian cafés like “Constantine” or “Balkan.” Literary circles in 1930s’ Shanghai were soaked in the sweet aroma of coffee. It was common to see writers in Shanghai walk into those cafés at dusk, as they talked well into the night and dawn. Old Shanghai was also characterized by a popping and hedonistic nightlife with numerous dance halls and nightclubs across the town. There were 3,300 registered dancers in 1946. The Paramount was the city’s most famous dance club. In keeping with its Chinese name “Gate of a Hundred Pleasures” (Bai Le Men), the club was a shimmering monument to glamorous debauchery, with the newest, hippest American jazz played by Russian musicians. Despite the influence from the West, the Shanghainese still carried on their Chinese traditions in daily life, especially in their food culture. In old Shanghai, before the Western dishes became public treats, only the upper class could afford them. For the lower classes, these rich art deco restaurants were merely for festivals or important celebrations. Local cuisine still dominated their daily food culture. Shanghai is located in the major rice production areas of China. Rice is the most common material used in daily meals. In addition to the steaming or boiling rice, the Shanghainese also cooked rice dishes by mixing rice with vegetables, and cured meat or sausage. Shanghai cuisine has adopted influences from other cuisines in the region, giving it a delicate appearance and a slightly sweet taste. The article was edited and translated from the Insights into Chinese Culture, published by the Foreign Language Teaching and Research Press in 2008. Ye Lang and Zhu Liangzhi are professors at Peking University.